Rock music followers from the South would remember him as the erstwhile bass guitarist of the Malayali folk-rock band Avial. And the rest of India would recognize him as playing bass alongside his brother and Kailash Kher as part of Kailasa. As our latest entrant to the spotlight series, we present to you one of the leading bass guitarists of India, Naresh Kamath. And believe me, this is as comprehensive as an interview could ever get! If you don’t, read and see for yourself. It must be fun to have a brother at home whom you can jam with. So how did you and Paresh get into music? Could you take us through your upbringing? Well I’d have to say that my brothers( Harish is the eldest.. not a musician though!) have been a big influence on me in my child hood. They’d be hearing music on the radio since when I was a toddler. Harish knew all the hindi songs and used to sing them whenever there was a party. We all went to Boarding school in Panchgani( Hill station near Mahabaleshwar) called St Peters high school.There we had a music teacher that taught us the western style of music, like how to sing in a choir and sing harmonies etc. They taught us songs of the Beatles etc. We started making our own songs even before we knew how to play an instrument. So basically we were pretty deep into music by the time we got out of school. Paresh picked up the guitar right about the time he got out of school and soon he was part of a band and basically there was no looking back! For me, living in a house with an elder brother, who was already in a band and with me as deep into music as he was, I was destined to do the same. After playing separately in different bands for a while, we found ourselves trying to learn Jazz and fusion music under the guidance of Dinshah Sanjana, in a legendary band called ‘Divya‘. It was quite a steep learning curve for us rocker boys at that time, but we realized that our hunger for musical knowledge could not be jailed by any particular genre of music and so we found ourselves playing jazz fusion music with Divya at international music festivals! You used to be a vocalist once upon a time. Why did you drop that for bass guitar? Do you have plans of going back to mainstream vocals in future? My voice is the first instrument that I learned to play and later on I realized that I was pretty good at it. I remember when I was in the 10th standard, I used to practice air drumming and the first time that I sat on a drum kit, I actually played a proper beat, so I was super excited. I asked my dad if I could buy a 2nd hand drum kit, which amounted to 15 thousand rupees at that time. My dad said OK, but he asked me to take a day to think about it, to see if I was really sure I wanted to play the drums. That day Paresh told me that I was a very good singer and I should be concentrating on my singing instead of learning drums. I took his advice and from then on I started concentrating on my singing! I started singing for various rock bands and even won singing awards at rock competitions around the country. The problem with rock bands in our country is that just don’t stick together. That’s exactly what happened to my band at the time and only the drummer and me were left. Drummer and singer are not a good jam combination, so I decided to learn the bass guitar so that I could jam with my drummer. I used to play basic chords on the acoustic guitar and could doodle around on it, so learning the bass became easier for me and I got really deep into it. I’d sometimes practice for the whole night into the morning. I became pretty good at it in a relatively short period of time. Around that time Paresh & me got into Divya and started learning jazz-fusion music which is essentially instrumental music, so singing straightaway took a back seat and before I knew it I was considered a bass player and not a singer really! Since I had started singing Western songs in the rock bands while growing up, Hindi singing didn’t come naturally to me. I had to really work hard to be able to sing in Hindi and not sound like a foreigner! But over time as I’ve been working with other hindi singers and artistes,composing hindi songs etc. I’ve become more comfortable and confident with it. I have already sung songs in a few films like Luck (Jee le), Teen Patti (Intezaar), Pyaar Impossible (10 on 10) etc. I love to sing and singing actually helps me in composing my own tunes, so who knows I’ll come out with my own album some day ! Most Keralites would know you more as an erstwhile Avial member than a present Kailasa member. Can you tell us a bit about your musical forays prior to Avial? While I was in college I’d already become a roadie for Paresh’s band Witch Hammer, which was pretty well known in Bombay at the time. I ended up joining them when there singer quit, but It didn’t go too well for me,as I was new and didn’t have the experience, on top of that I was replacing a good singer with a big following and believe me, rock audiences can be really unforgiving. 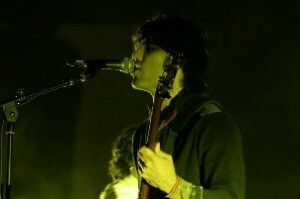 I then joined another band called Modus Operandi and we did pretty well in the rock scene in Bombay. We used to cover bands like Extreme, Mr.Big, Whitesnake etc. But that didn’t last too long and it ended up with just the drummer and me! At around this time I picked up the bass and withing 6 months I was playing bass on stage with my brothers band. That’s when Dinshah Sanjana spotted us and threw us a proposal to play at an international jazz festival within a year, if we joined his band called Divya. Divya completely changed my musical outlook and I was never the same again. You were the only non-Malayali member of Avial. And if I am right in my guess, this is the only musical ensemble you were part of without your brother being involved. How did you end up with Avial? And why did you leave it? Have you considered a return (This is more a hope than a query!)? Avial has been a comparatively recent development. I used to play and make music for a dance company called The Daksha Sheth dance company and thats where I met Rex from Avial. We really got along as friends and musically. Between rehearsals we’d jam a lot and that was real fun. Rex told me that he had his own band and that they were recording their album soon. He wanted me to play on it and I agreed. It took about 6 months for things to materialize and I ended up going to Kerala to record with the Avial boys. I had a really nice time hanging out with Rex & Tony while recording the album, enjoying the Kerala experience and I also ended up eating Avial for the first time! I was never really a part of the band Avial. The way I see it, I was invited to come and play bass on their album and so I did. Later they started getting show offers, but they still hadn’t found a bass player to play all that material, so they asked me if I could play live gigs with them too, but I was already a part of Kailasa, so it would’ve been very difficult for me to manage playing in both the acts. I did end up playing with them for a few gigs, but at the same time I asked them to find a permanent member for their own good. How did you come to collaborate with Kailash Kher for Kailasa? How has the experience of working with Kailash Kher been? After our stint with Divya, Paresh & I had decided to get into music direction & production seriously, so we worked on making a home production studio. We had started producing remix albums and worked with Shaan on his album Aksar and were basically making our foray into the music industry. Thats when we got an offer to produce a new singer called Kailash Kher. We had never heard of this guy, but his representatives sent us a cd of his voice and a guide track separately of the song Piya re Piya re. They asked if we could make some music over it and send it back to them. When we heard his voice we were really impressed as it was not the typical bollywood voice and it had that raw element to it. We had not heard the original Nusrat version so we made the music we thought would work well with it and sent it back to them. Kailash loved it and wanted to meet us, from then on there was no looking back. Working with Kailash over the years has been truly amazing and a great experience. When we started out, no one knew of him. All we had was our love for music and the mutual respect we had for each other. Now after all the success that Kailasa has had and all the fame that Kailash has achieved, those two things haven’t changed and that’s I think the secret of our success. You had done a wonderful composing job in Dasvidaniya. And even the 2 tracks you did for CC2C were neat. Why no movie scores after that? Composing for movies is something that we’re really looking forward to. Unfortunately for us, after CC2C & Dasvidaniya, we’ve had few opportunities to compose for a movies, although we have composed the title track Allah Ke Bande, for the film with the same name. Meanwhile we’re working on the material for our 4th album and along with our touring, we’re keeping ourselves busy. Apart from Kailasa, what are your other current engagements? Do you do bass for other composers in movies or otherwise? Paresh & I along with other members of Kailasa have our own English band called Hipnotribe. We take every opportunity to play live, when Kailasa is not touring. Right now we’re working on recording our album, which should hopefully be completed soon ! As I sadi earlier, I do a little bit of play back singing myself, not just for movies but also tv advertisements etc. Apart from that I do music production for advertisements & tv shows. I also do background scores for movies. As far as playing bass for other composers, it happens very rarely, as bass is an instrument that stays mostly in the background. Most music producers are happy playing bass on the keyboards, so if you are a bass player looking for studio work it’s gonna be few and far between. But saying that, I do get calls every now and then, to play bass as they want a ”live feel” to it! You were into folk-rock fusion with Avial. Even with Kailasa there has been the occasional sufi-rock fusion. Considering your experience in the field, what do you think of the direction fusion rock is taking in India? What do you think of its future here? Do you have any similar dream fusion projects you would want to implement? The great thing about fusing folk music with contemporary sounds and music is that you can take a little of the old and mix it with the new to create something which is unique to you, which can represent your thoughts and ideas and still have the ethnicity in appealing to a larger audience, especially in India which has such a humongous and vast repertoire of folk music. Anything that is done genuinely and from the heart has a high success rate according to me, so while there’ll always be fads or trends in music, the longevity of any genre or artiste will depend on the genuineness of their music. As of now I don’t have any specific plans, but I have a lot of music in me which is waiting to be expressed, so I’m sure something will prop up soon enough. Who are your inspirations? Fav artists? As a musician I consider myself as a sponge which absorbs all kinds of music and stores it somewhere in my subconscious. All the music I heard from childhood, like hearing Pt. Bhimsen Joshi on the morning radio to hearing Lata Mangeshkar on tape singing Meera bhajans, not to mention all the film songs sung by Kishore Kumar, Mohd. Rafi etc. they stay with you. I learnt Beatles songs in boarding school, then got into western pop music, hearing bands like the Police, Duran Duran, not to forget Michael Jackson, Prince etc. After that hearing rock music in college, Guns n Roses, Metallica,Van Halen, Sound Garden, Red hot Chili Peppers, Extreme, Mr.Big etc. (and for me the biggest of them all) Led Zeppelin, all the staples of rock music, had a big influence on me. I got into jazz fusion music where bands like Tribal Tech, Trilok Gurtu’s Crazy Saints, Weather Report etc made a deep impression on me. Jamiroquai, Sting, Seal, more recently Cold Play, Imogen Heap, Jazzanova, John Mayer, Jeff Buckley… I can go on ! On the home front, R.D. Burman & A.R. Rahman, always the path breakers, Vishal Bharadwaj, Lucky Ali‘s solo albums too, I love them. Having done so many live shows, is there any memorable live show moment you would like to share with our readers? There have been many memorable shows and some funny moments too.. recently Kailasa played at a show in HongKong for Kingfisher and it’s clients. Mr.Vijay Mallya the owner of King Fisher was called on stage to give a speech. If you have ever been on a Kingfisher flight you would know that a recorded ‘welcome aboard’ speech of Mr.Mallya always plays where he asks his guests to feel like as if they’re in his own home and if they had any complaints they could contact him “personally”. The whole band was familiar with this as we’ve travelled Kingfisher gazzillion times! As expected Mr. Mallya repeated his offer at this speech, asking all present to contact him “personally” in case they had any complaints or queries. The whole band was in splits, when we we heard the word “personally”. After the speech we gathered ourselves and got on stage for or performance, but before we started Kailash introduced himself and Kailasa to Mr Mallya and then went on to tell Mr. Mallya that if he had any questions or complaints, Mr. Mallya could contact him “Personally” lol! Here’s wishing Naresh besto for all his future endeavours. We shall be back with another artist pretty soon! Naresh Kamath u should make serious rock band like LINKIN PARK. I didnt knew that you were playing just bcuz the band lacked a bass guitarist but to tell you i was so proud that a south band that too from my native place had such talents and can come out with such creative “LISTEN 2 ME ” kinda rock music and now after reading all this it just broke my heart bro…no fair.